The big news of the day, before the stage was that Andrew Talansky had to abandon the Tour. There were five men in the breakaway, Gregory Rast (Trek), Simon Clarke (Orica), Sebastian Langeveld (Garmin), Florian Vachon (Bretagne) and David de la Cruz (NetApp-Endura). Vachon won the intermediate sprint beating Gregory Rast for €1500. In the sprint for sixth Marcel Kittel beat Bryan Coquard to take 10 pts. De la Cruz took the top points on the 4th Category Col de Brouilly and the 3rd Category Cote du Saule-d'Oingt, Rast took the other point on the latter of the two climbs. At the top of the Saule-d'Oingt the lead of the break was over the four and three quarter mark. On the descent, David de la Cruz crashed o the descent and his injuries looked serious and had to abandon due to his injuries. On the Col des Brosses, Vachon and Rast were both dropped and caught by the peloton. Langevelt beat Clarke to take the points at the summit of the climb. On the climb of the Cote de Grammond, Perrig Quémenuer and Cyril Gautier of Europcar attacked off the front of the bunch. There was a minor crash at the back of the peloton which included a Trek and a Lampre rider. With 26 km to go Simon Clarke attacked Langeveld to go solo, Langeveld was caught quickly by the two Europcar riders. Simon Clarke topped the climb solo but was caught by the Europcar riders on the descent. They held a 50 second lead with 20 km to go. Gallopin who was distanced on the climb,was not able to catch back on to the peloton on the descent. Jon Izaguirre had some bad luck in recieving a puncture on the descent and he had to chase back on. Marcel Kittel was dropped on the final climb and didn't catch back on to the peloton and was left with Joaquim Rodriguez at the back of the race. Quémenuer was caught with 9km to go, that left the break to a group of two. The escapees were caught 5km from the finish line. Andre Greipel with Sylvain Chavanel was involved in a crash at the back of the peloton. 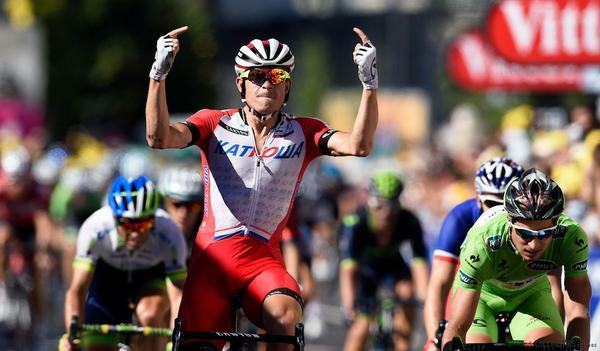 Alexander Kristoff beat Peter Sagan on the line to take the stage win.